Striking colours and scented foliage year after year. A fabulous celebration of pellen rich perennials specially selected to bring b3eauty and attract wildlife to your garden. Get ready for summer and fill your garden with these beautiful, complementing perennial varietiers which will bloom year after year. 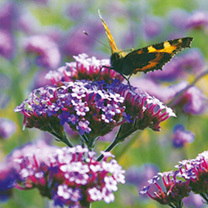 Our enormous perennial collection features 96 Value Plug Plants, 16 each of 6 perennial varieties – that’s just 20p per plant!Verbena bonariensis – A ‘must-have’ border plant! This incredible perennial produces a profusion of tall, wiry stems carrying tufts of tiny flowers that bring a soft and airy feel to your displays every summer. Height 100cm (40). Back of border variety. F.lowers from June-November.Monarda Panorama – Aromatic foliage – This monarda (more commonly known as bergamot) boasts deliciously scented foliage and intriguing blooms, in shades of rose, violet, pink, scarlet and red. Loved by bees. Flowers June-August. Height 90cm (3′). Back of border variety.Nepeta Blue Moon – Extremely striking! This first year flowering perennial boasts large, dense, pale blue flower spikes. It’s early blooming, free-flowering and heat tolerant. Soft, hairy, aromatic foliage. Flowers June-September. Height 45cm (18). Middle of border variety.Lysimachia Beaujoulais – Masses of flowers for months on end. A first year flowering perennial with an upright growing habit, producing sturdy, deep wine-red flower spikes that are highly attractive to butterflies. Flowers late May-September. Height 40-50cm (16-20). Back of border variety.Scabiosa Fama Blue – A beautiful cut flower. This first year flowering perennial is a big attractor of bees and butterflies. It boasts deep blue flowers atop strong stems. Flowers June-September. Height 50cm (20). Middle of border variety.Agastache Liquorice Blue – Aromatic foliage. This first-class variety produces attractive, upright spikes of hooded rose-purple blooms that are a magnet for bees and butterflies. Flowers June-September. Height 60cm (24). Front of border variety.Varieties will be individually labelled. ORDER WHILE STOCKS LAST. 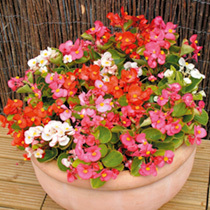 This better than half price offer includes our two most popular Begonia plants, supplied as plug plants for you to grow on, the deal features 135 Begonia Ambassador and 135 Begonia President, ideal for beds and borders or for a colourful display on the patioBegonia Ambassador F1 Plug PlantsVery striking! These extremely popular annual bedding begonias produce compact, bushy, mounded plants, with waxy leaves and flowers that are produced in profusion all summer long. Height 20cm (8).Begonia President F1 MixA good range of flower colours. These extremely popular annual bedding begonias produce compact, bushy, mounded plants, with waxy leaves and flowers that are produced in profusion all summer long. Height 20cm (8).